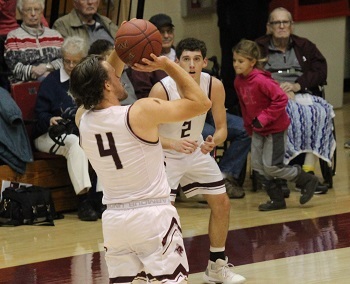 College of the Ozarks picked up their ninth win of the season Tuesday evening, as they defeated the Evangel University Crusaders, 108-60, in the Rib Crib Highway 65 Rivalry Shootout. The Bobcats jumped out to a quick 19-7 lead, which continued to increase thanks, in part, to a steady production of three pointers by Klay Barton, Treydon Rackley, Brandt Cochran, and Heath Carmichael. In addition, the Bobcats played tough under the basket, collecting rebounds and defending against the easy basket. College of the Ozarks held Evangel to only 17 points in the first half on 16.7% shooting from the field. Meanwhile, the Cats shot 50% from the field, and hit 40% of their 15 three-point shots. In the second half, Cochran opened up by sinking three treys for the Bobcats, and his teammates followed suit, draining a total of 12 for the half. Evangel shooting improved to 48.6% from the field, and the Crusaders connected on four three-pointers of their own. The Bobcats put up 64 points in the second half to tie their season-high point total for a half. When the night ended, the Bobcats had tallied 18 three pointers (47.4%)—their highest number this season, and posted a 56.8% field goal shooting percentage. Cochran led the game with 23 points and 4 steals. He also shared the lead in assists with Barton at six apiece and nabbed 8 rebounds. Six Bobcats scored in double figures. Joining Cochran were Carmichael (20 pts., including 5 treys and 4 assists), Barton (15 pts., three 3-pointers), Ethan Davidson (13 points and a game-leading 12 rebounds), Rackley (11 pts., 5 assists), and Storm Price (11 pts., 7 reb.). Evangel was led by Cade Coffman and Tory Stamps, each with 15 points. Stamps also led his team with 7 rebounds and 4 assists. The Bobcats improve their record to 9-3, while the Crusaders fall to 1-9 on the season. 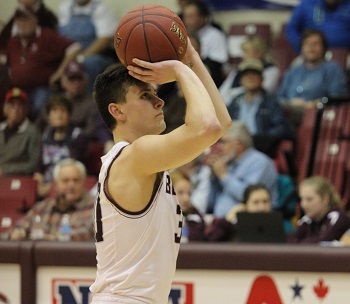 College of the Ozarks will take their home court again later this week as they face Northern New Mexico College twice—Friday at 3 PM and Saturday at 3 PM in the Keeter Gymnasium.